My baby was five months old when she flew across Europe for the first time. A year later and she has been on nine flights and countless road trips with the occasional train journey and ferry crossing thrown in. Travelling with a baby can be quite stressful at the best of times, so to make things easier on everyone directly or indirectly involved, I have come to rely on the following eleven items which, to me, are worth their weight in gold. 1. Buggy – I love my Graco buggy. It serves me faithfully and it has come unscathed not only after all those flights, but even after a visit to a Roman villa from the 1 century BC with egg-sized gravel paths. Not to mention our daily walks on the cobbled streets of Vicenza, the frequent strolls through grassy parks and the constant folding and unfolding in order to fit it in the boot of our little red car. It performed like a star even in Venice, where we carried it over countless bridges on a very hot September day. It’s light, easy to manoeuvre and it was very reasonably priced. 2. Ergo – Where would I be without my Ergo baby carrier?! It cost a pretty penny, that’s right, but it has served me so extremely well, that, I can boldly say, it was one of the best purchases of my entire life. Above all though it helped me feel close to my baby when we were out and about shopping, socialising or just going for a walk. It made it easy for my baby to engage confidently with the world whilst still safely snuggled in me. Often she would smile at people and they would smile back or she would stretch her little arms to touch something I was interested in, giving us a lovely bonding experience. The best bit though is being able to carry her at airports without getting numb arms all the long way from the arrivals gate through customs to the baggage carousel. A few weeks ago, I took her in her Ergo carrier all the way up a 40 meters mountain slope to see a waterfall enclosed in a cave. On the way down we met a family with the mother carrying their baby in her arms. The poor lady was out of breath and constantly re-adjusting the position of the baby. I felt a little smug and especially grateful for my Ergo then. 3. Lead/Harness – I am aware opinions on using a lead or harness are split. Years ago I was firmly opposed to them, finding it weird that people would want to tie up their poor toddlers in one, instead of bending a little and holding them by the hand. I am not ashamed to admit, that I was wrong. I was pregnant, when I observed a mother with two small kids using leads for both of them in the Natural History Museum in London. Both children navigated the huge crowd confidently with the mother being able to give them a relative independence whilst still keeping a watchful eye over them. So, after some thought, I decided I would get a lead for my baby, too, when the time comes. After an initial period of feeling slightly awkward about using it, the lead is now a firm fixture in my baby bag. 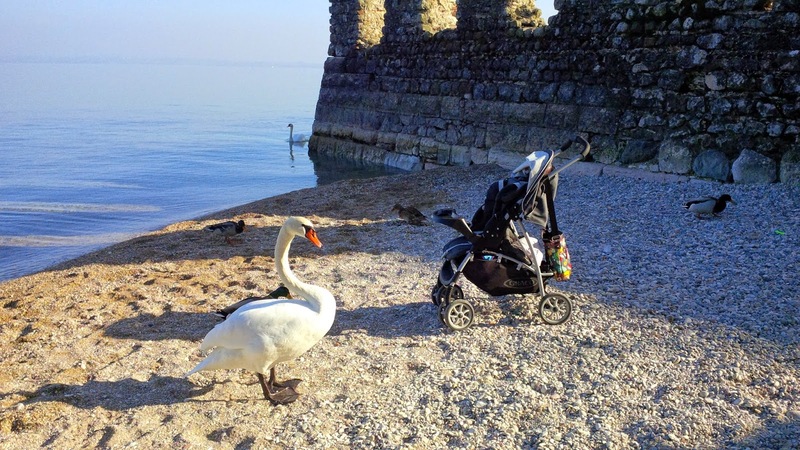 Being blessed with a very active baby, it helps me give her freedom of movement, when we are out and about exploring Italy, and at the same time it gives me reassurance that she wouldn’t just dart into the crowd. 4. Food Storage Boxes– I bought a set of boxes from Ikea and they are serving me so well. I always carry a snack or some lunch for my baby when we go out, not to mention the three course meal when we fly. We used the baby led weaning method, which means that she was introduced to solids from six months of age onwards, so I couldn’t rely on shop bought purees when on the move, neither could I buy a ready meal, as they are usually quite high in salt. So, I got used to always have on me a box with sliced fruit, another with pieces of toast and some scrambled eggs and, if we are travelling, then I can add a box with boiled potatoes, some peas and thinly sliced chicken breast. Just a word of warning, though: if you are flying, I would lay off the eggs. In the cabin their smell is really strong and fellow passengers can be put off. 5. Tommee Tippee Sippee Cups – I bought these little cups from our local Sainsbury’s in Chatham (when we lived there) and they are serving us so well. They are light, which helped when my baby was still quite small and lifting the full cup with water was quite difficult for her at first. Most importantly though their spout folds in. This is very handy, as I don’t have to think about where I left the cap, neither worry that it may fall off on a dirty floor when we are out and about. 6. Single Use Changing Mats – The changing mat my baby bag came with was rather small. Well, it was just the standard size, but when your baby is six centimetres longer than the average baby at birth, standard size simply is not enough. So, we bought some single use changing mats and I have been in love with them ever since. I find them easy to use and more hygienic, especially in the case of public baby changing rooms. I always wipe the changing station with a wet wipe first, but the single use changing mat on top gives me added reassurance that there is a safe clean layer between my baby and the countless nappies that have been changed on that spot before. 7. Change of Clothes– This is self-explanatory, I believe, but I will give you an example anyway. Last week-end we popped down to Arqua Petrarca – a beautiful stone village in Northern Italy where the famous poet Petrarch spent the last years of his life. We had a wonderful time visiting his house and the other local sights. Our baby had an even more wonderful time exploring the muddy garden in the cafe where we had our lunch. At the end of some very active 20 minutes running up and down, squealing with delight at the sight of the local cat and collecting pebbles from the ground, we had one happy, but so muddy baby. The change of clothes we always carry in the baby bag was put to good use. 8. Blanket – Apart from providing an extra layer, when your baby may be feeling cold, I have found a blanket really useful, when I have had to breastfeed on a plane. Try doing it in a confined space, with strangers sitting on at least one of your sides and a baby that is trying to adjust herself to the new and stressful environment. Our yellow blanket with a cute embroidered bunny was all we needed to create a safe haven for me and her. Later on, when she fell asleep, the blanket was folded and tucked between my arm and her head for some extra comfort for a sleepy head. 9. Wet Wipes – They are so versatile and so useful, I never leave the house without a packet tucked in my bag. I use them to quickly wipe surfaces that will be touched by my baby when we travel or eat out. High chairs in restaurants are usually quite sticky, so a wet wipe comes in really handy. Little hands need a quick wipe, too, especially after running around and petting dogs (which are abundant in Italy and whose owners are only too happy to hold them still, so that delighted babies can touch them). In all honesty, if one day I am in a position to buy stocks and live off the proceeds, I would be wisely investing in wet wipes manufacturing companies. Just a word of caution, though – never throw a wet wipe down the loo. 10. Nappies – I always take double the quantity I think my baby would need, when we travel or go on a day trip. You just never know! 11. Muslin Squares – I remember shopping at Babies’R’Us before my baby was born and looking at the packets with colourful muslin squares and really not knowing what they were for. My husband, being braver than me, asked one of the other customers (a lady with a muslin square tied around the handle of her buggy): ‘Excuse me, what are these for?’. To this day I am thankful to her, as she convinced us that muslin squares are just the thing every parent needs. We are still using ours every day, mainly to tie one around our baby’s neck at mealtimes. We find them easier to use than bibs, they don’t take much space in the baby bag and I can improvise with them in so many different ways – from a bib through a makeshift table cover to a light throw over the buggy or the carseat when the day is really hot and the sun is blazing outside. So, what do you think? Which item do you find indispensable when travelling with a baby and what would you add to my list?